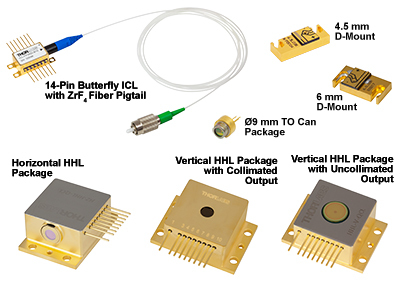 Thorlabs' TO-can-packaged Fabry-Perot Quantum Cascade Laser provides the power and broadband mid-IR emission of a Fabry-Perot QCL in a convenient Ø9 mm TO can package. The broadband emission, which spans over a roughly 50 cm-1 range, makes this laser well suited for medical imaging, illumination, and thermal signal simulation. The Ø9 mm TO can package incorporates an additional copper disk for added heat dissipation. The additional material makes this TO can thicker than standard; however, the laser is still compatible with all Ø9 mm laser mounts. An AR-coated ZnSe window protects the device from dust and debris. The output power of this Fabry-Perot quantum cascade laser is the sum over the full spectral bandwidth. Before shipment, the output spectrum, optical power, and L-I-V curve are measured for each serial-numbered device by an automated test station. These measurements are available below and are also included on a data sheet with the laser. After clicking "Choose Item" below, a list will appear that contains the dominant wavelength, output power, and operating current of each in-stock unit. Clicking on the red Docs Icon next to the serial number provides access to a PDF with serial-number-specific L-I-V and spectral characteristics. While this QCL is specified for CW output, pulsed output is possible. The laser does not have a built-in monitor photodiode and therefore cannot be operated in constant power mode. 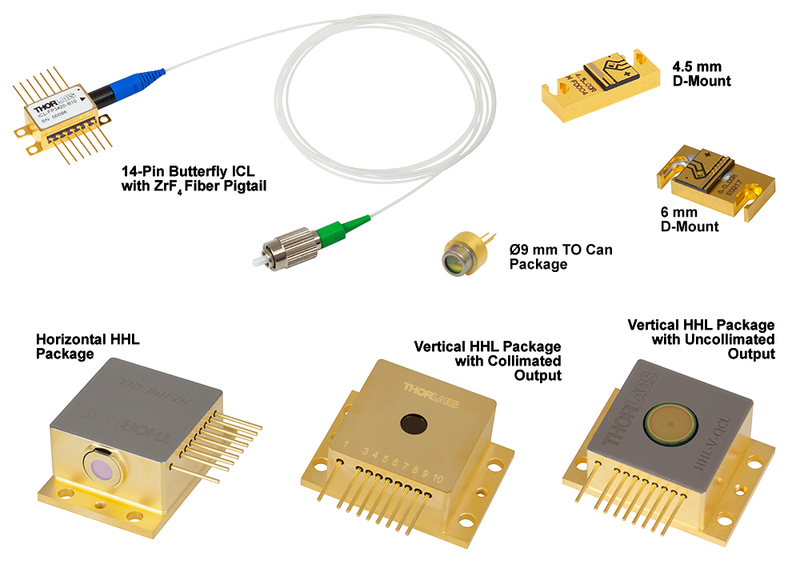 If designing your own mounting solution, note that due to these lasers' heat loads, we recommend that they be mounted in a thermally conductive housing to prevent heat buildup. Heat loads for Fabry-Perot QCLs can be up to 18 W (see the Handling tab for additional information). Thorlabs manufactures custom and OEM quantum cascade lasers in high volumes. 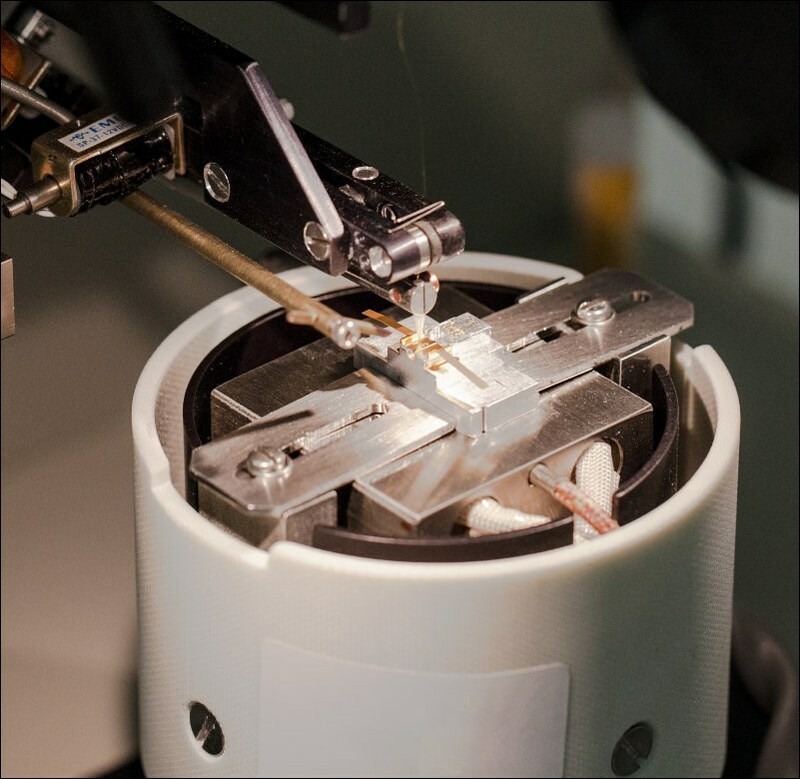 We maintain chip inventory from 3 µm to 12 µm at our Jessup, Maryland, laser manufacturing facility and can reach multi-watt output on certain custom orders. More details are available on the Custom & OEM Lasers tab. To inquire about pricing and availability, please contact us. A semiconductor specialist will contact you within 24 hours or the next business day. Use the tables below to select a compatible controller for the QF4600T1 QCL. The first table lists the controllers with which the laser is compatible, and the second table contains selected information on each controller. Complete information on each controller is available in its full web presentation. The typical operating voltage of this QCL 12 V. To get L-I-V and spectral measurements of a specific, serial-numbered device, click "Choose Item" next to the part number below, then click on the Docs Icon next to the serial number of the device. Thorlabs' LDM90 Laser Mount is fully compatible with the ITC4002QCL and ITC4005QCL controllers; however, the mount itself has a limited heat load of 8 W, meaning a QCL cannot be driven at full power in this mount. If designing your own mounting solution, note that due to these lasers' heat loads, we recommend that they be secured in a thermally conductive housing to prevent heat buildup. Heat loads for this QCL can be up to 12 W.
Thorlabs does not currently offer cables that connect the LDMC20 mount to this controller. Custom cables will be required. Proper precautions must be taken when handling and using two-tab C-mount, TO Can, D-mount, or high heat load (HHL) lasers. Otherwise, permanent damage to the device will occur. Members of our Technical Support staff are available to discuss possible operation issues. Since these lasers are sensitive to electrostatic shock, they should always be handled using standard static avoidance practices. Unlike TO can and butterfly packages, the laser chip of a C-mount or D-mount laser is exposed to air; hence, there is no protection for the delicate laser chip. Contamination of the laser facets must be avoided. Do not blow on the laser or expose it to smoke, dust, oils, or adhesive films. The laser facet is particularly sensitive to dust accumulation. During standard operation, dust can burn onto this facet, which will lead to premature degradation of the laser. If operating a C-mount or D-mount laser for long periods of time outside a cleanroom, it should be sealed in a container to prevent dust accumulation. HHL lasers and TO cans are sealed (although the seal is not hermetic), so the laser chip will not be exposed to air. However, similar dust avoidance precautions should be followed for the window on these packages, since the windows are exposed to the atmosphere. These lasers should always be used with a high-quality constant current driver specifically designed for use with lasers, such as any current controller listed in the Drivers tab. Lab-grade power supplies will not provide the low current noise required for stable operation, nor will they prevent current spikes that result in immediate and permanent damage. Temperature regulation is required to operate the laser for any amount of time. The temperature regulation apparatus should be rated to dissipate the maximum heat load that can be drawn by the laser. For our two-tab C-mount or TO can quantum cascade lasers, this value can be up to 18 W. The LDMC20 C-Mount Laser Mount, which is compatible with our two-tab C-mount package, is rated for >20 W of heat dissipation. The LDM90 Ø9 mm TO Can Laser Mount is only rated for 8 W of heat dissipation, so quantum cascade lasers cannot be operated at full power. Our DFB D-mount laser's maximum heat load is 7.2 W, our FP D-mount lasers' maximum heat load is 25 W, and our HHL QCLs have a maximum heat load of 38 W.
The back face of the C-mount package and the bottom face of the D-mount or high heat load package is machined flat to make proper thermal contact with a heat sink. Ideally, the heat sink will be actively regulated to ensure proper heat conduction. A Thermoelectric Cooler (TEC) is well suited for this task and can easily be incorporated into any standard PID controller. The HHL package incorporates a suitable TEC. A fan may serve to move the heat away from the TEC and prevent thermal runaway. However, the fan should not blow air on or at the laser itself. Water cooling methods may also be employed for temperature regulation. Although thermal grease is acceptable for TO can and HHL lasers, it should not be used with two-tab C-mount or D-mount lasers, since it can creep, eventually contaminating the laser facet. Pyrolytic graphite is an acceptable alternative to thermal grease for these cases. Solder can also be used to thermally regulate two-tab C-mount lasers, although controlling the thermal resistance at the interface is important for best results. Solder is not recommended for thermal regulation of D-mount or HHL lasers. When making electrical connections, care must be taken. The flux fumes created by soldering can cause laser damage, so care must be taken to avoid this. Solder can be avoided entirely for two-tab C-mount and TO can lasers by using the LDMC20 or LDM90 laser mounts, respectively. If soldering to the tabs on a two-tab C-mount, solder with the C-mount already attached to a heat sink to avoid unnecessary heating of the laser chip. We do not recommend soldering lasers in TO can packages. Although soldering to the leads of our HHL lasers is possible, we generally recommend using cables specifically designed for HHL packages. Please note that third-party cables for high heat load packages are typically not rated for the 4.5 A maximum current of the internal thermoelectric cooler. If soldering to the leads on an HHL package, the maximum soldering temperature and time are 250 °C and 10 seconds, respectively. 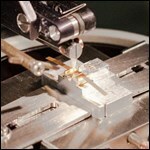 For D-mount lasers, solder should never be used; wire bonding or probe connections are the only recommended methods. As any interaction with the package carries the risk of contamination and damage, any movement of the laser should be planned in advance and carefully carried out. It is important to avoid mechanical shocks. Dropping the laser package from any height can cause the unit to permanently fail. At our semiconductor manufacturing facility in Jessup, Maryland, we build a wide range of mid-IR lasers and gain chips. Our engineering team performs in-house epitaxial growth, wafer fabrication, and laser packaging. We maintain chip inventory from 3 µm to 12 µm, and our vertically integrated facilities are well equipped to fulfill unique requests. For Fabry-Perot lasers, we can reach multi-watt output power on certain custom orders. The available power depends upon several factors, including the wavelength and the desired package. For distributed feedback (DFB) lasers, we can deliver a wide range of center wavelengths with user-defined wavelength precision. Our semiconductor specialists will take your application requirements into account when discussing the options with you. The graphs below and photos to the right illustrate some of our custom capabilities. Please visit our semiconductor manufacturing capabilities presentation to learn more. Fabry-Perot Lasers exhibit broadband emission. The center wavelength is defined as a weighted average over all the modes. Each device has a unique spectrum. To get the spectrum of a specific, serial-numbered device, click "Choose Item" below, then click on the Docs Icon next to the serial number of the device. If you need spectral characteristics different than those shown below, please contact Tech Support to request a custom laser. The Ø9 mm package for the QF4600T1 is 4.30 mm (0.17") thick, which is more than the standard 1.50 mm (0.06"). The laser will still be compatible with all Ø9 mm laser mounts; please see the Drawing tab in the blue info icon ( ) above for full package specifications.